Gluten-Free Spinach and Ricotta Ravioli is a gorgeous creamy dish that can be enjoyed by the whole family! And did you know you can make gluten-free pasta dough in our Panasonic bread maker? This recipe is lovely whether or not you eat gluten! Tried and tested here in the kitchen this dish is perfect for helping you master your gluten-free cooking. You can even get creative with different ravioli shapes! PASTA DOUGH: Whisk the two medium eggs with water to make 260mls (with both eggs and water). Place the flour, starches and gum into another bowl and mix well. Add all the ingredients to the bread pan and select the gluten-free pasta dough program. When the program has finished, wrap the dough in cling film and rest for 1 hour in the fridge. FILLING: Add spinach to boiling water, cook for 2 mins until wilted. Remove from the pot and drain. Put in a tea towel and squeeze to drain any moisture, then finely chop. Mix all the filling ingredients with the spinach, except the beaten egg, until well combined. Leave in the fridge to firm up slightly. 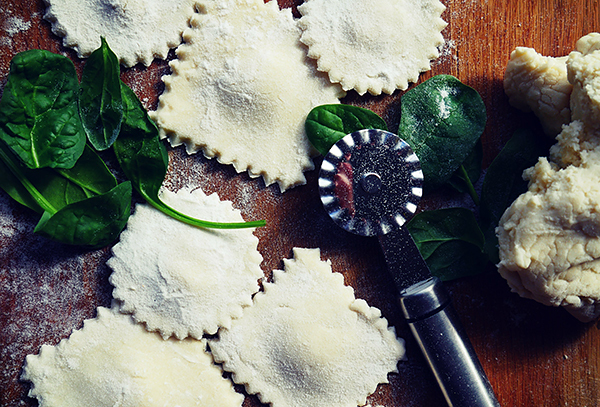 CREATING THE RAVIOLI: Lightly flour a surface, cut the ball of dough in half; re-cover one half with a tea towel. Roll out the other half of the dough with your rolling pin. Add flour if it gets sticky and keep rolling until your sheet of pasta is about 1/8-inch thick. Repeat with the other half. Place a heaped teaspoon of the ricotta mixture at equal intervals along the pasta then lay the other sheet of pasta on top. Carefully press down around each filling ball to remove any air. Add the ravioli in batches to some rapidly boiling salted water, cook for 2-3 mins or until al-dente. Top with your chosen pasta sauce. We chose tomato!